"Well, that was easy to fix. Big dogs need big beds. Little dogs need little beds. 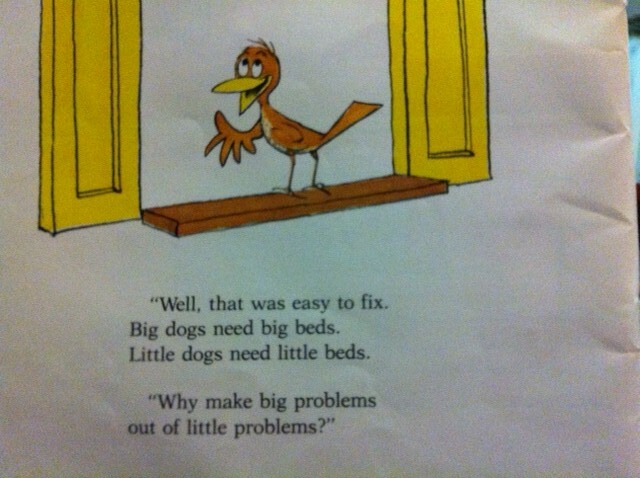 Why make big problems out of little problems?" These lines are from one of H's favourite books to read before he goes to bed. It has been a favourite of his for some time, as evidenced by the slightly worn page edges and sticky-taped back cover. Sometimes I will read it all, sometimes we take turns reading alternate pages; last night though, H read the whole story to me. I literally know the words of this book back to front. As I listened to H read those final few words the other night, it got me thinking. 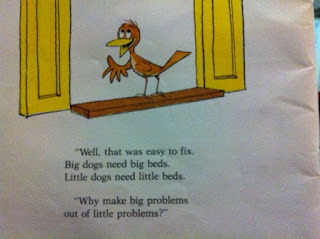 Despite being a children's book (and maybe because of it) Big Dog, Little Dog raises a very interesting question. Why do some people make mountains out of molehills? It surely can't be for their health. Nine times out of ten, stress is not worth the time or energy. Life is complicated enough without creating drama and tension where there simply isn't any. I don't know about you but I find that way of living really draining. Maybe it's because I have a child with autism. That in itself can be a pretty definitive leveller. I simply don't have the time or patience to deal with unnecessary problems because I have always had much bigger things to think about. Like finding a job in my new, adopted country. Being there for the Groovy Grandma during her battle with breast cancer. And now, getting H settled into high school (wherever that may be) or successfully managing his transition into a well-adjusted adult with an active, fulfilled life. That's not to say I don't stress about stuff, I absolutely do. But I don't go looking for problems and I don't make things harder for myself by thinking the worst. I'm an optimist by nature 99% of the time, which probably explains my reputation as someone who copes well in a crisis. I don't always, though. Far from it. I've faltered and I've stumbled. At times, I've made a right bloody mess of things. And I'm sure I will again. But it won't be because of an imaginary problem of my own making. I guess what I'm trying to say is this: Life is short. Don't waste it by worrying about the minutinae of the mundane. Think about the BIG PICTURE. Don't sweat the small stuff. And listen to those little birds in your life - they can make a lot of sense. Yes very true, Sarah. I wish I wasn't such a stress head over stupid things. Part of being Aspie I guess, but a challenging part. I think we're all guilty of stressing over silly stuff at times, Sirbear! I know I certainly am. But then you just have to try and do better the next day.